‘Old Guys rule…’ The man judiciously placing himself near the bar and in front of the stage was among friends and listening to just the kind of music his generation has loved – since he was a Young Guy. The slogan on his T-Shirt spoke volumes while John Coghlan’s Quo played volumes from the Status Quo song book. It was one of those exciting nights when everyone in the audience was enjoying themselves as much as the band on stage. It had been quite a battle for Quo to actually get to the venue, due to the ordeal of trying to park a van in the West End of London. Once a pleasant place for visitors, full of music and book shops, Soho and its borders is now a wasteland of building sites, uncollected rubbish and graffiti. But enough of all that, what about the gig? Once the four hours spent attempting to find their way to the Borderline, unload the gear and set up was over, there was just enough time to grab a lager and start rockin’ and rollin’. The Borderline has been revamped since my last visit, with the bar now relocated to where the soundman used to preside. So it’s possible to watch the show from a high stool at a safe distance, without getting totally ear blasted. What are the origins of the band? Well John Coghlan was of course the drummer with the original Status Quo, playing alongside Francis Rossi and Alan Lancaster in the Spectres in 1962 before they became the group we all know and love with the arrival of Rick Parfitt in 1967. Their debut single ‘Pictures Of Matchstick Men’ was a Top Ten hit and by 1973 they had made the classic ‘Pile Driver’ album that established their hard rock sound and boogie style. John left in 1981 to form his own band Diesel and later The Rockers with Phil Lynott and Roy Wood. In 2013 he rejoined Francis, Rick and Alan Lancaster for two sold out Status Quo Frantic Four reunion tours. The J.C Band aka John Coghlan’s Quo was formed in the 1990s intending to recreate the authentic 1970s Quo sound and that’s just what the Borderline crowd heard to their great delight. With John’s commanding presence at the drums the band members were assured of a driving force behind them as they stormed into action. Mick Hughes (guitar, vocals), Rick Chase (bass, vocals) and Rick Abbs (guitars, vocals) quickly established their credentials with a rockin’ ‘Junior’s Wailing’ a Steamhammer number featured on the 1970 Quo album ‘Ma Kelly’s Greasy Spoon’. In quick succession came ‘I Saw The Light’, ‘In My Chair’ and ‘Don’t Break The Rules’ and the unusual ‘All The Reasons’ from ‘Pile Driver’ with John playing muffled beaters rather than sticks. Among the throng bouncing up and down to the relentless beat was Nettie Baker, Ginger’s daughter and friend of the Coghlans, cheerfully volunteering to sell a pile of Quo’s merchandise. Somehow we had a conversation during a break in the head banging and I also managed to visit the band back stage in the dressing room at half time. Soon we were ‘Rockers Rollin’ again as the second set exploded with a cornucopia of hits notably ‘Caroline’, ‘Roll Over Lay Down’ and even ‘Pictures Of Matchstick Men’ with its uniquely penetrating guitar theme. “For me this is sound of parties when I was 17 years old!” enthused fellow spectator and famed lead guitarist Jon Kershaw. I knew the feeling, having danced myself at the age of 16 to those classic Quo hits like the vigorously up tempo ‘Paper Plane’ complete with its chopping axe solos. The band’s jubilant supporters sang along and cheered as we headed for ‘All The Reasons’ and ‘Rain’ not to mention ‘Big Fat Mama’ also from ‘Pile Driver’ which has that amazing pause for breath in the middle. ‘MORE!’ demanded the audience and a dynamic lead guitar intro built the tension as John’s pounding drums drove all before him. Yes, it was time for the encore ‘Down Down’ during which it was back to entire body shaking, never mind yer heads. The Borderline faithful clapped their hands red raw, yelled and developed severe sore throats. Seriously? Yep, I’m on the level Guv’nor. 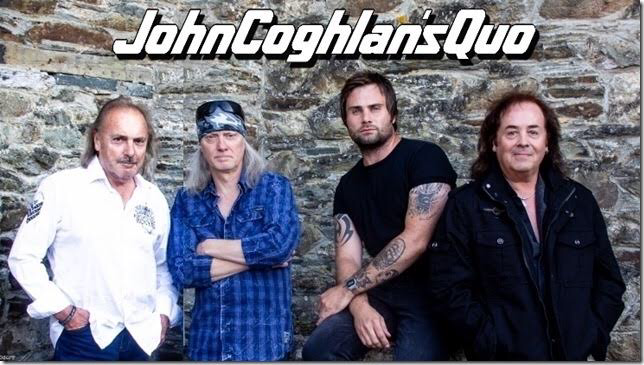 If John Coghlan’s Quo hit your town don’t miss ’em. And that goes for the entire continent of Australia where they are headed in 2019.